City Garden in downtown St. Louis is, quite possibly, one of the best sculpture parks I’ve ever seen. And that’s saying a lot because sculpture is really not “my thing”. But the way this park is set up and laid out you can easily forget that you are viewing sculpture- it’s more like fancy playground equipment set around splash pools and walking paths. Take the untitled sculpture that look like two rabbits. 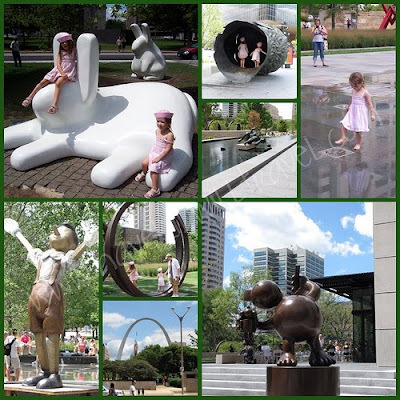 They were been created by Tom Claassen – who may or may not be a famous sculptor, I have no idea – but to my girls they were a great place to climb and slide. Not to mention they are entirely too cute. Or how about Kindly Geppetto by Tom Otterness (the large photo, bottom right). He just made me smile. The large head, Eros Bendato by Igor Mitoraj, that the girls are exploring inside of sat at the top of a flat fountain. Other sculptures sat in the center of small pools and children crawled in, out and around them. Sure, I could tell you about the environmentally friendly green roof on the Terrace View Cafe or I could explain the three bands that represent the geographic features of St. Louis and its surroundings and each of their water features. I could even go into the plants in City Garden- 109 different species of trees, flora and fauna. But really, why go in to all that when the most important thing I can say about City Garden is this: City Garden is probably the most serene place you can find set in the middle of a city. It is a perfect spot for a family outing. With plenty of shade for sitting under and all the places for kids to splash; it’s idyllic. Take a picnic and enjoy life. Oh, and be sure to find the “hidden” music spot near the Pinocchio sculpture. It’s not on the map (which does list every sculpture). City Garden is free and open every day from sunrise til 10 pm. Terrace view hours are Monday through Thursday – 7 am to 7 pm, Friday through Saturday – 7 am to 10 pm, Sunday – Closed. Every path is handicapped accessible. Park Security is on site and very noticeable in their bright yellow shirts.